Four bedroom / four bathroom cottage with new sun room, master dining room with wet bar and towered bedroom with roof deck overlooking the Sea of Abaco. Blue Coral Landing. 4 bedroom 4 bathroom waterfront cottage with dock on Sea of Abaco. Sleeps 6. Blue Coral Landing, Great Guana Cay, Abaco, Bahamas is located directly on the Sea of Abaco and a three-minute walk to the Atlantic Ocean. Tie your boat to our dock. Enjoy the breathtaking sunsets from our front porch swing. Our cottage is recently completed (spring 2009) and is set in a secluded area in the protected Fisher's Bay. You are a short walk to the shops and restaurants/bars (including the world-famous Nippers). 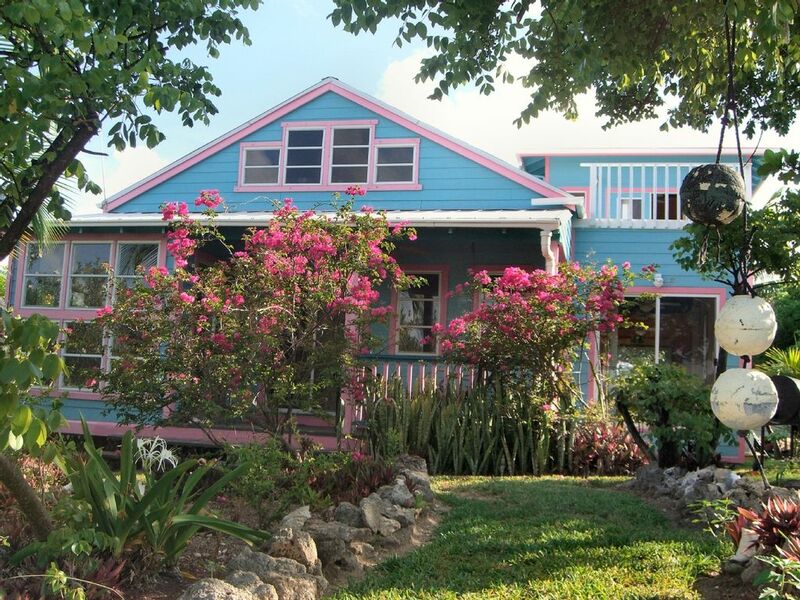 Blue Coral Landing is a Bahamian Cottage painted in the traditional Junkanoo colors of turquoise and pink. Amenities & Activities: Our cottage is ideal for a family with children or two couples. Three of the bedrooms have queen-size beds and the Fourth bedroom is a King Size bed in the tower. Each bedroom has its own private bathroom. We have great views of the water from the entire cottage. Central Air Conditioning, TV, DVD, Stereo, CD Player, Full Kitchen, Microwave, Refrigerator, Cooking Utensils provided, Linens provided, Charcoal Grill (BBQ), Pets NOT allowed, No Smoking. Hiking, Fishing, Bone Fishing, Restaurants, Sightseeing, Swimming, Snorkeling/Diving, Boating, Water skiing, Surfing, Shelling.